FRESH questions have been raised over party political funding in Northern Ireland, with calls for greater clarity around Sinn Féin fundraising in the United States. The Detail can reveal that while the party is still raising millions of dollars in the US, there has been a sharp drop in the amount of money reaching Northern Ireland since a tightening of donation rules in 2007. But now Alliance leader Naomi Long said she is meeting with the Electoral Commission to ask how the rules allow Sinn Féin to use tens of thousands of dollars classified as gifts. The Alliance leader is also seeking a meeting with the Secretary of State on the issue. Records filed under the US Foreign Agent Registration Act (FARA) show that Sinn Féin in Northern Ireland received over $180,000 – the equivalent of £138,000 - from its US fundraising arm, Friends of Sinn Féin, between 2012 and 2018. The party told The Detail these monies do not represent donations but are accumulated gifts of less than £500 and that the party is fully compliant with current rules on political donations and funding. A spokesperson for Sinn Féin said: “Any monies which come from Friends of Sinn Féin to the north of Ireland are made up of gifts from individuals, which are under £500 and therefore not deemed donations by the Electoral Commission. The names of these individuals are supplied to the US Justice Department.” They added: “Sinn Féin is fully compliant with all funding regulations in Ireland and the US." Sinn Féin said the identities of all US funders are passed to the American authorities in line with regulations there. Previous media reports have named prominent donors, but the Electoral Commission confirmed it does not have oversight of monies falling below the £500 donation threshold, even when such funds accumulate to tens of thousands of pounds. The Commission said political parties are duty bound to ensure that all donations are permissible. There is no allegation of wrongdoing, but Alliance leader Naomi Long, who campaigned at Westminster for greater transparency over the funding of political parties in Northern Ireland said: "The rules restricting overseas donations are there to prevent any undue foreign influence over politics here; create a level playing field between parties; and, allow the public to be confident that parties act in the public interest and not that of large donors. Transparency and confidence are both being undermined as a result of this aggregating process,” she said. "While such gifts may be individually insignificant amounts, when aggregated in this way, they become very significant. "As a result of what has been uncovered, I am meeting with the Electoral Commission and will also seek a meeting with the Secretary of State to ensure that these issues are addressed urgently." Meanwhile the records also raised questions about donations to the SDLP. Media reports in 2006 claimed Irish billionaire Denis O’Brien and another businessman had pledged to donate $750,000 to support the SDLP’s US operation. Records in the US show two donations labelled as being from "Denis O'Brien" of $52,765.50 in 2007 and $50,000 in 2008 to the SDLP’s US office before it closed. In response to questions from The Detail, the SDLP did not clarify if the donations were part of the reported $750,000 funding pledge, or if Mr O’Brien had made further donations between 2008 and 2017. The party did confirm, however, that it is “not currently receiving donations” from the telecoms and media mogul. New legislation introduced by the UK government in March provided transparency on the identity of political donors to parties in Northern Ireland for the first time. However, those donors will only be named if their donation is above £7,500 and if it was made after July 2017, which it is feared will leave many below the radar. The Detail previously reported on the UK government’s refusal to backdate transparency on donations to 2014, as was proposed under legislation previously tabled by the Alliance Party’s Naomi Long. The issue of political funding has surfaced regularly in recent years. Questions remain, for example, on the origins of the £435,000 donation that the DUP received from the Constitutional Research Council (CRC) during the Brexit referendum campaign. There is no public information on how the CRC is funded, though the DUP and the CRC have previously said they adhered to all the rules relating to such donations. New legislation introduced in November 2007 sought to regulate political donations in Northern Ireland for the first time, including donations from outside the UK. The rules restricted foreign donations for political parties in Northern Ireland, but permitted donations from UK and Irish citizens, companies, trade unions, limited liability partnerships, or unincorporated associations. In 2007 a donation was defined as anything above £200, though that threshold has since increased to £500. Political parties are required to report to the Electoral Commission any donations above £7,500 that are made to the central party, plus donations above £1,500 to accounting units or to individuals within the parties. Below these reporting thresholds, parties must also nevertheless check the permissibility of all donations and record every donation above £500. While the new rules in 2007 significantly reduced Sinn Féin’s income from America, they did not bring this revenue stream to an end. Since 2000 Sinn Féin’s US fundraising arm, Friends of Sinn Féin (FOSF), brought in more than $10 million in donations and fundraising income to support its work to “promote the cause of Irish unity and to support the Irish peace process”. Historically FOSF has been an important source of income for the party through transfers of ‘Money to Ireland’, which have been reported biannually to the US Department of Justice under the Foreign Agent Registration Act (FARA) since 1995. A ban on foreign donations in the Republic of Ireland (from January 2002) and the introduction of the restrictions on overseas funding in Northern Ireland (from November 2007), however, has had a significant impact on Sinn Féin’s income from the States. In the year leading up to the 2007 rule changes the party in Northern Ireland received $650,000 from the US. Records filed by FOSF, however, reveal a significant drop in the amount of funding sent to Sinn Féin after 2007. 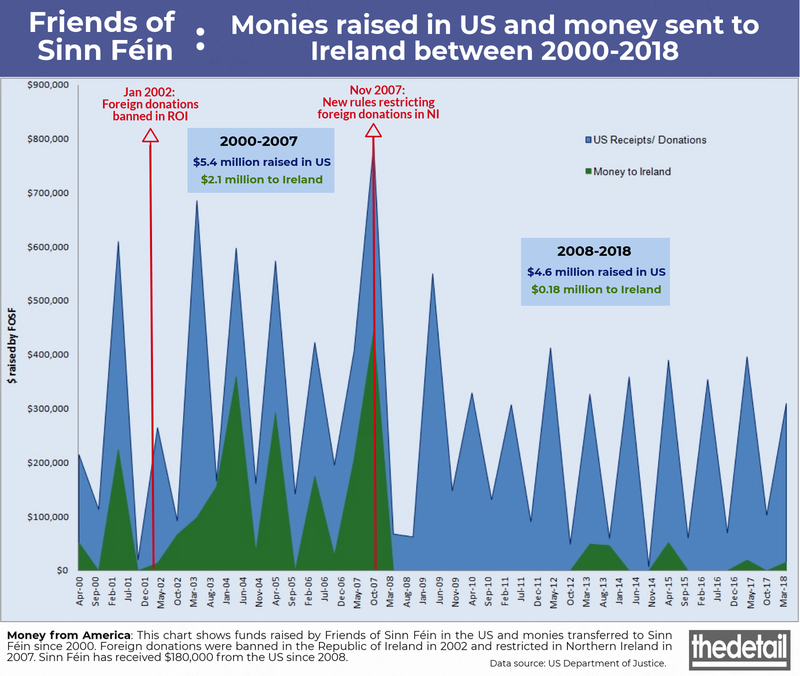 As the following graph illustrates, Sinn Féin received over $2 million of more than $5.4 million raised in the US between 2000 and 2007 compared to $183,000 out of $4.6 million raised Stateside between 2008 and to date in 2018. Most of the money appears to be held in the US, where records show spending on fundraising events and costs for visiting Sinn Féin representatives. Records further show that in Northern Ireland more than $180,000 was spent on Sinn Féin election-related expenses, advertising, transportation costs and professional fees. In its most recent return to April 2018, FOSF records show that $15,931.75 was spent on Sinn Féin expenses in Northern Ireland. Last year $19,887 was recorded as spent on “election related printing and advertising expenses” for Sinn Féin. Between November 2012 and April 2015 a further $148,000 went towards printing, advertising, transportation, vehicle purchases, and professional fees. Responding to questions from The Detail, Sinn Féin said it liaised with the Electoral Commission in relation to the 2007 rules and that any monies received from the US are aggregated gifts of less than £500 and therefore are not political donations. A spokesperson for the party said: “Sinn Féin engaged with the Electoral Commission over a two-year period to ensure that the systems put in place were in full compliance with the rules governing political donations. "Sinn Féin is fully compliant with all funding regulations in Ireland and the US. “All monies raised by Friends of Sinn Féin are recorded with the US Justice Department and all Friends of Sinn Féin accounts are published bi-annually on the Department of Justice website. “Any monies which come from Friends of Sinn Féin to the north of Ireland are made up of gifts from individuals, which are under £500 and therefore not deemed donations by the Electoral Commission. The spokesperson further confirmed that the monies transferred to Northern Ireland are recorded under “sundry income” in the party’s annual accounts, which are submitted to the Electoral Commission. Sinn Féin did not respond to specific questions on monies spent on ‘election-related expenses’ in 2017 but a spokesperson said all electoral spending was recorded in the party’s electoral returns. The Detail also put questions to the Electoral Commission. Asked how it satisfies itself in relation to the permissibility of aggregated monies received from the US, the Electoral Commission said monies below the £500 donation threshold were outside its remit but that political parties are obliged to check the permissibility of all monies and donations received. A spokesperson for the Commission said: “It is the responsibility of the Party Treasurer to ensure all donations to the party are from a permissible source and that they are reported correctly. Under the Political Parties, Elections and Referendums Act 2000 (PPERA), a donation is defined as being a benefit of cash, goods or services in excess of £500. Individual donations of £500 or less are not a donation under the rules. Parties are required to include all income and expenditure in their annual accounts. The Alliance Party, however, has called for further clarification on the sourcing of funds from the US, in particular, how significant funds have been pooled. 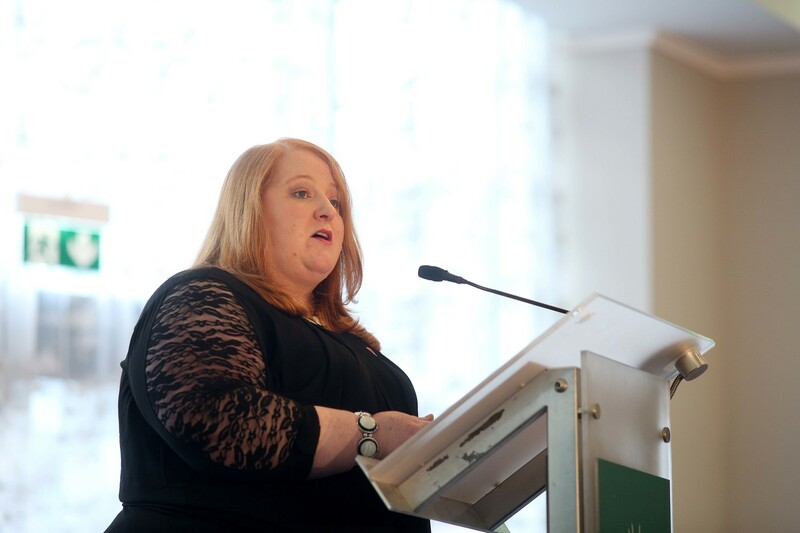 Despite Sinn Féin stating it adhered to US and UK donation rules, Alliance leader Naomi Long said the process of aggregating significant funds in this way raised a number of questions. To address the issue, Long called for a change in the regulations for all parties: "To limit any potential abuse of aggregated amounts more generally, a threshold for the maximum permissible amount of aggregated small gifts to any party should be reduced to £500 in any 12 month period." Meanwhile the SDLP has declined to comment in detail on whether Irish billionaire Denis O’Brien donated to the party after the reported pledge of support in 2006. As an Irish citizen Mr O’Brien is entitled to make donations to any political party in Northern Ireland. The party did confirm, however, that it is “not currently” receiving donations from Mr O’Brien. The following extracts from US Department of Justice records show that two donations of the order of $50,000 in November 2007 and April 2008 were made by a Denis O'Brien. The SDLP closed its US office in 2008, according to FARA records filed with the US Department of Justice. 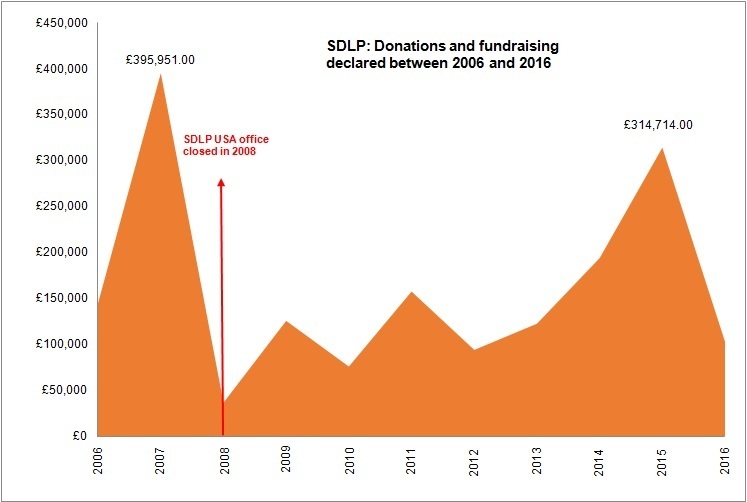 The following graph shows how total donations and fundraising income to the SDLP, as declared in its annual financial statements to the Electoral Commission, declined after 2007 when the rules tightened. The spike in donations and fundraising, shown in the graph below, which was recorded by the SDLP in 2015 is not covered by the UK government’s new transparency rules, as the funding was received before July 2017. There is no allegation of wrong doing in relation to the donations or the donors. The Detail located the two receipts from FARA records in the US, which recorded donations to the party’s US operation. The SDLP did not indicate if the total of $100,000 donated in 2007/2008 formed part of the funding reportedly promised by Mr O'Brien in 2006. Commenting on the donations a spokesperson for the SDLP said the reported pledge of support from 2006 was already "public knowledge". The party further stated it had “complied fully” with rules on donations. A spokesperson for the SDLP said: "It should be noted that in compliance with the changes in electoral legislation individuals who donate more than £7,500 after July 1 2017 will be made public. The SDLP is complying with this legislation. "Prior to July 1 2017 under electoral legislation in Northern Ireland the names of all donors remained confidential. "The SDLP is not currently receiving donations from Mr O'Brien."